Popular Nigerian singer, Tiwa Savage, on Sunday clinched the 2018 Best African Act at the MTV European Music Awards, EMA. The singer, who is the first African female to win the award, beat fellow Nigerian, Davido, and other African acts to the prize. Speaking on her historic win, Tiwa Savage attributed her victory to the massive support of fans. 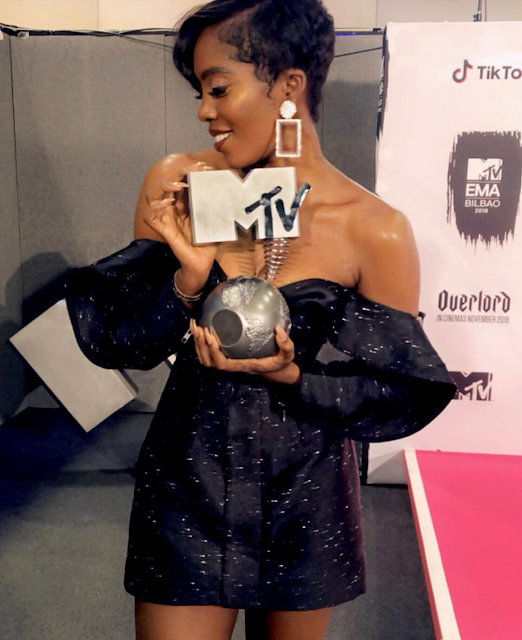 Also, 26-year-old Nigerian, Hauwa Ojeifo emerged winner of the first-ever “MTV EMA Generation Change Award”. Ojeifo, who founded a movement of love, hope and support to give mental health a voice in Nigeria, was announced winner alongside four other nominees: Xiuhtezcatl “X” Martinez (USA), Ellen Jones (UK), Mohamad Aljounde (Lebanon) and Sonita Alizadeh (Afghanistan). Meanwhile, American artiste, Camila Cabello, with four awards, was the biggest winner at the event.